“Slapshot” is one of the most unlikely successes to come out of Hollywood. Though it takes place in the U.S. it’s a quintessential Canadian story of minor league hockey, a warts and all inside look into a unique sports culture. Yet, it took Hollywood’s brightest stars to exploit this story and tell it more truthfully and entertainingly than any Canadian could have. First of all, who knew that Paul Newman could skate so well, and play hockey even with such skill and believability? And why would the Oscar-winning director of “The Sting” and Butch Cassidy and the Sundance Kid” want to make a movie about hockey? Well, Newman was once a hockey player as a kid, so he had natural puck handling skills. As for Hill, the fact is Nancy Dowd’s well researched script is not only knee-slapping hilarious, it’s one of the most authentic sports scripts ever written – a fearless and unpretentious look into the sport. Like “Bull Durham”, one of the greatest baseball films ever made, minor leagues provides the point of view into the sport. The milieu of working class, semi-pro althetes, with the same worries, wants and desires as it’s audience, makes for a much deeper examination of sport, and the dedication it takes to win and make a living at it. “Slapshot” tells the story of the Charleston Chiefs, a hapless minor league hockey team led by a player/coach Reg Dunlop (Mr. Newman). Dunlop's career is coming to an end, yet he remains on autopilot with his team. Winning or losing doesn't seem to matter until he discovers the manufacturing plant which drives the town will soon go under - the death knell for the entire team. When a prospective buyer in Florida expresses interest, suddenly the stakes in winning and entertaining are elevated. The saviours of the team come from an unlikely trio of goons named the Hanson Brothers. Their physical play and unending enthusiasm for the game help them and the team become a league sensation. Unfortunately everyone's dreams of playing in comfort in Florida come crashing down when when Dunlop's dubious lies are revealed. With their final game at hand, the team decides to give their fans a crowd-pleasing extravaganza of entertainment on ice. The inspriation for Dowd's script came from Dowd's own brother and his experiences playing minor league hockey in the 70's. 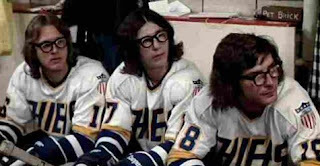 The scene-stealing Hanson Brothers were based on a trio of real life hockey players who play versions of themselves as well. After the movie the trio continued to play hockey and in retirement make celebrity appearances at events and appear in the two shameless sequels which followed many years later. In the United States "Slapshot" is generally considered one of the great sports films, but in Canada, the characters, gags and comic set pieces are so revered they are memorized with the same obsession cine-geeks have for, say, "Monte Python and the Holy Grail". Dowd's politically incorrect and lewd dialogue has made this one of the naughtier sports films - a genre now dominated by saccharine comeback films. And so Reg's dishonest actions and irresponsibility represents the perfect antidote these antiseptic Disney films. This movie is one of Quebec most important cult movies, with Elvis Gratton. It was one of the few movies to be translated using Quebecois slang, and many of its dialog are classics in Quebec: "Enwoeille, lève-les tes osties d'patins!"